A pilot's error caused a huge police response on JetBlue flight 1623 during a communication error. Marc Santia reports. Police swarmed a JetBlue plane filled with passengers on the tarmac at Kennedy Airport Tuesday evening, sparking a scare in what turned out to be a response to a radio equipment problem compounded by a co-pilot accidentally punching in a code for hijacking, according to officials. At first, it wasn't clear why police had surrounded JetBlue flight no. 1623 as it sat on the tarmac at JFK Tuesday evening. Passengers tweeted their alarm as they sat on the non-moving plane and noticed police cars outside, then officers in tactical gear storming the plane. Radio transmissions between the air traffic controller and the plane reveal initial confusion as the JetBlue flight, which was headed to Los Angeles, failed to respond to tower. Minutes later, the controller tries calling again, and still no answer -- and the flight by now is holding up other planes, transmissions on LiveATC.net show. The controller tries yet again to contact the flight, and starts telling other planes to try and go around the JetBlue plane. It turns out the plane experienced a radio equipment problem while taxiing for departure around 8 p.m., and the radio issue sent a false alarm to the JFK tower, according to a JetBlue official. When the crew had difficulties with radio communication, the co-pilot punched in the wrong code to let ground control know, and that turned out to be the code for a hijacking, according to sources. "While communication was reestablished via alternate channels, authorities responded out of an abundance of caution," JetBlue said in a statement. "The aircraft was cleared and returned to the gate for inspection." Airline expert and pilot PJ Tristani, who flew military and commercial planes for more than four decades, said what happened on the JetBlue flight was simply human error. "When he dialed that in, he missed one number and put in the hijack code, which is only one number different," said Tristani. "He could not erase the code, except that he could change the numbers, but it's too late because the transponder was one and transmitting ground radar picked up a squawk and so they reacted." "In a nanosecond that's being transmitted and there's nothing at all you can do about it." Photos posted on social media from inside the plane shows passengers holding up their arms as police in heavy tactical gear walked up and down the aisle. 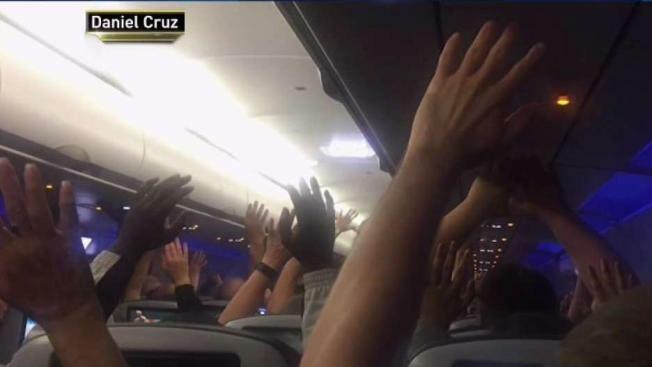 "They came on, told us to put our hands up," said passenger Sam Boone. "We couldn't really do anything." In radio transmissions between Port Authority police, one dispatch posted on Broadcastify says: "Security issue, they have a radio malfunction. They can hear what's going on but they cannot transmit at this time. Asking permission turn them back to the taxiway." "Negative at this time," an officer responds. "We're going to check out the aircraft right here, copy?" And finally shortly after: "Tower says they have radio contact with the crew. There is no security issue." The Port Authority, which operates the three New York City-area airports, confirmed the plane was inspected and cleared with no security threat. Tristani said while the situation was no doubt an embarrassment for the pilots, it is an impressive moment for police. "It was a textbook response," he said. "They surrounded the aircraft, they isolated the aircraft and then they responded on board." The FAA says it will investigate. Tristani said there's no doubt JetBlue will follow up, too: "The airlines will take that very seriously because, again, you alerted the response team and also you caused panic to the passengers."